"What a movie! Total 'paisa vasool'!" Haven't we all heard such remarks often and even judged things as good only if they are 'paisa vasool'. India is a country where we are taught to reuse, remake, see utility before spending and try and choose things that give us a little extra and are value for money or 'paisa vasool'. We try to save money wherever possible without compromising value and quality. A little extra is always appreciated, be it the extra free mirch (green chillies) and dhania (coriander) we ask from the vegetable seller when we buy vegetables from him or the buy 1 get 1free offer items we buy when shopping. Seeing how we like a 'little extra' and are always on the lookout for 'paisa vasool' things, Lufthansa has brought a new super 'paisa vasool' premium economy class for its Indian flyers where we can experience luxury, comfort and expert service of the first class by paying just a little extra over the economy class fares! 1) Bigger seats with 50% more space so the passengers can stretch out properly and are more comfortable. 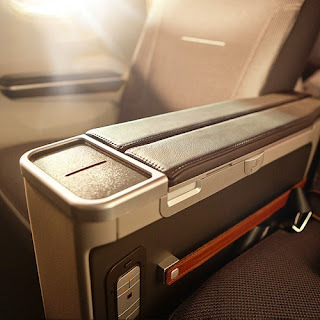 Compared to the economy seats offered by the various airlines in India which are cramped, congested with little leg space, this option definitely had my eyes shining. For taller people, this option is like a boon. Now forget about paying extra to get those privileged seats with more leg space and choose Lufthansa Premium Economy when flying and just pay once with no extra charges! 2) The seats in the Lufthansa Premium Economy class are new, wider and only one seat away from the aisle. Lean back, stretch and enjoy travelling! 3) Feel like King when welcomed with the welcome drink! After settling in your super comfortable seat, enjoy a welcome drink and there is even a drink holder to keep it so you don't spill it. Isn't it cool! 4) Haven't we all felt uncomfortable resting our hand on the single middle armrest, feeling conscious of the other passenger's discomfort? Well, Lufthansa Premium Economy class solves this problem with the introduction of separate armrests. Now, rest your arms, relax and feel premium. 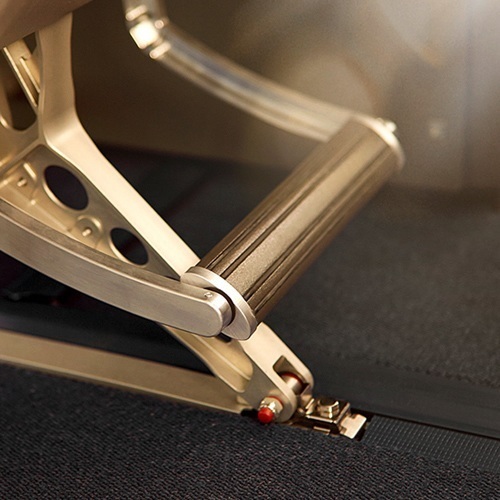 5) Lufthansa Premium Economy class also offers footrests so we can support and stretch our feet and be comfortable. There is nothing better when travelling long distances! Say goodbye to all the stiffness and pain in the legs from keeping it folded for long and luxuriate by using these footrests. 6) Storage Space- Are you like me who has so much to keep at hand that I often struggle with the little storage space at my seat when flying? Bid adieu to your storage worries with the extra storage space at your seat provided in Lufthansa Premium Economy class which allows us to keep everything important to us with us on board. 7) To make the passengers more comfortable, Lufthansa provides a travel kit with a moist towelette, an eye mask, ear plugs and a toothbrush. 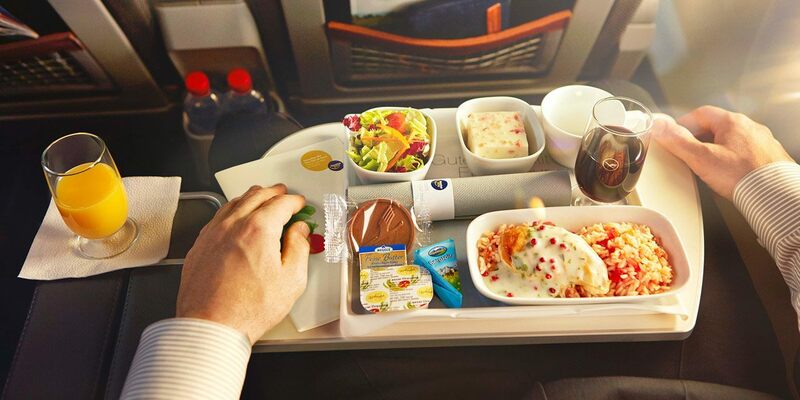 Feel fresh all through the flight and feel the luxury with the expert care provided in Lufthansa Premium Economy class! 8) Choose from an extensive food menu and get your food served in proper china tableware! 9) With the sturdy fold-out table, you can enjoy your food or work on your laptop without inconveniencing yourself. Feel right at home when eating or at office when pounding the keys of your laptop, this table can handle all! 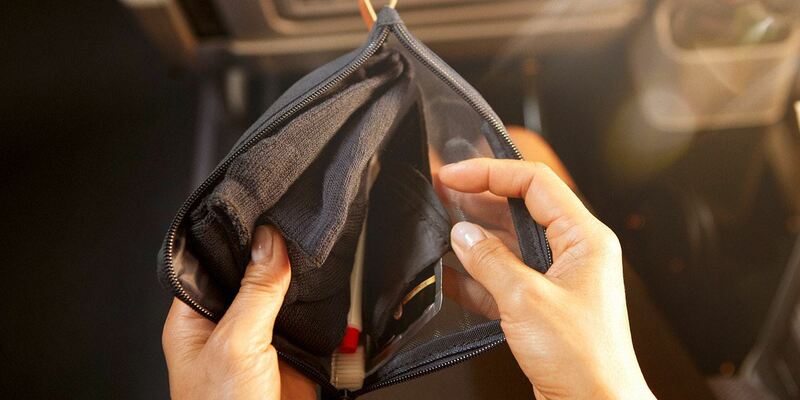 10) Get rid of the hassle of calling the air hostess every time with the water bottle provided to keep you refreshed and hydrated throughout the flight. 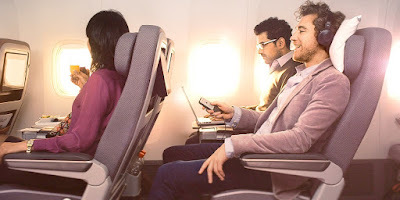 11) Get rid of the boredom of long flights by watching shows on the 11"/12" screen, provided at each seat and feel the hours go by in minutes as you enjoy the entertainment offerings. 12) As if watching TV is not enough, feel right at home with the remote which allows you to select what you want to watch, listen to and play. With this detachable remote, there is no need to leave your comfortable posture to change channels or modulate the volume. Cool, right! 13) Feel more relaxed, there is a separate power socket at your seat so you can use power when needed. 14) 2 * 50 lbs free baggage- Don't pay extra for that second bag and enjoy that extra baggage facility only in the Lufthansa Premium Economy class. 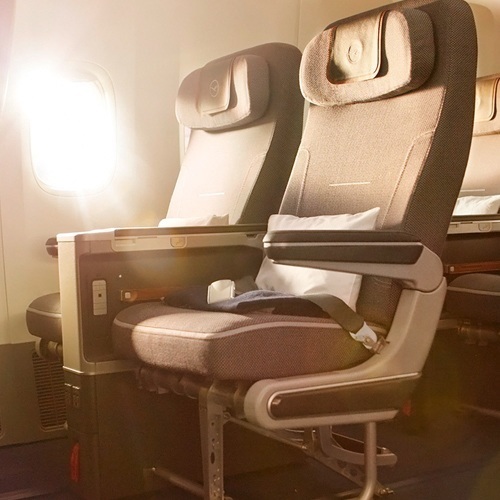 15) Pay a fee and enjoy the super comfortable Business Lounge when travelling in the Lufthansa Premium Economy class. Currently the Lufthansa Premium Economy Class is available only from Delhi and Bengaluru but it will become available for other cities soon. From the very famous Indian creations, "jugaads" to the history creating 'paisa vasool' Indian Mars mission which used minimum of funds as compared to any space mission ever, Indians love saving money and if you can get something extra, it's always appreciated! So when you read about an airline that is giving first class travelling experience at such appreciatively low rates (a little over the economy rates) then what do you do? I say, you plan your trip with this airline and experience world class luxury! What are you waiting for? Go travel and enjoy flying in the new Lufthansa Premium Economy Class and experience all these 'paisa vasool' features first hand. I know I will be planning a holiday and flying in the Premium Economy Class and will recommend it to my friends and family. What are your thoughts? Do share in the comments section below.